Homeschooling families are all too familiar with this question. I remember growing up as a homeschooler and hearing people express their grave concerns about how we would ever function in society. “They really should be in school—to be socialized.” And then as an adult, unschooling our own children, I remember hearing this question and being defensive about it. For a while, I’d point to all the social activities the kids were involved in, like play dates and church activities and field trips. But then as I continued to read and reflect more about the social institution of traditional schooling, I stopped being defensive. It suddenly became easy to answer the question. When we learned about the social environment of Sudbury schools, loosely characterized as “unschooling schools,” we started to see some value over and above what unschooling had to offer. And it almost entirely had to do with the social environment. I still didn’t like the term “socialization,” because it brought up for me what most people are referring to—school-ization. But now we were thinking about it in a new way. I’ll get to that in a minute, but first let’s go back to some basics. Growing up is about becoming independent. When we’re born, we’re totally dependent on our parents, especially our mothers. We’re not only physically dependent on them, but emotionally too. The quality of our attachment to our parents is crucially important for establishing security and a sense of well-being in life. That sense of security leads into self-confidence later in life. Over and over again, attachment parenting has shown that—far from kids becoming overly dependent on their parents, they establish such a sense of security that, when they get older, they feel emboldened to take things on by themselves. They somehow internalize the sense of security they got from the close bonds they had with their parents so that even when they ostensibly break those bonds, they continue to carry that sense of security with them into adulthood. And I honestly think that will be true regardless of what schooling environment kids find themselves in (traditional, unschooling, or otherwise). By the time they go to school, it’s relatively late in life. They’ve had a chance to either develop strong bonds with their parents and that attendant sense of security, or not. (Maybe I should spend more energy evangelizing attachment parenting rather than educational alternatives, but I digress…) Even so, people are resilient, amazing creatures. We’re always adapting to our environment, learning new things, refining our model of the world, and growing. The longer I’ve reflected on this, the more laid back I’ve gotten about schooling choices. “Huh?” you may ask. “What about all the rhetoric on this blog?” Well, it’s true, I do want to jar people into thinking about this stuff. It is important. But ultimately, except in the worst of situations, kids are not going to be destroyed. There are plenty of happy kids in public schools. They’re learning to cope and make sense of their world just as much as anyone else. Is sending your kids to a Sudbury school an indication that you don’t trust them to thrive at home? Have you then failed at trusting your kids? This is a trap. I could just as easily apply that logic to traditional schooling. Is pulling your kids out of public school an indication that you don’t trust them to thrive at school? The point is that trust is contextual. Trust as a value in and of itself is a bit misguided. We need to be specific about who and what we’re trusting. Otherwise, we can hoodwink ourselves into thinking that making any choice for change indicates we’ve somehow failed at “trusting.” Can you think of any examples of people or situations you do not trust? Or that you should not trust? Does that mean you’re not good at trusting? More to the point, can you think of two good, trustworthy things and yet choose one over the other? For my family, unschooling and Sudbury schooling were those two good things. We’d be happy doing either. But we saw even more value in Sudbury than in unschooling. In particular, we saw that, by separating from their parents for a period of time each day, our kids would learn a measure of independence they would not gain—or not gain as effectively—without doing so. This was not easy. We had to let go of being aware of what they were doing all the time. We enjoyed the privilege that unschooling parents have: experiencing and sharing in practically all their growth experiences. That was hard to let go of. But we could see—and were convinced by everything we learned from others who had gone before us—that there was gold in them thar hills. To be around your parents constantly, even as you grow beyond 4, 6, 10, 13 years old is to miss out on the opportunity to experience early on what it’s like to participate in a larger community as an individual without the safety net of having your parents nearby. Parents, regardless of parenting style, have an immense power over their kids. We see many parents abuse this power. We also see parents take this power very seriously, doing everything they can to ensure that their influence on their kids will be a good one. Yet if your parents are never far from your side, you are missing out on the opportunity—I know this is a statement of the obvious—to experience yourself outside that context. We were impressed by the kids we saw in videos like Voices from the New American Schoolhouse. We were impressed by how articulate and thoughtful these kids were, by how considerate they were of other people in their environment, and by how much they valued respect and responsibility. And, yes, we made value judgments. We were making judgments about what we valued for our kids; among those values was the desire for our kids to have the experience of making their own value judgments and decisions about what to do with their time in contexts unmonitored by their parents. We saw that by sending our kids to a Sudbury school, they would be free—even more free than as unschoolers—to grow into the contours of their unique potential. And of course, it’s not just separation from parents that is valuable. It’s the participation in a wider community—larger than one’s own family, sharing space and resources, learning to respect other people, learning responsibility, learning how one’s own actions affect others, whether positively or negatively. It’s about broadening your social awareness and deepening your social skills by participating in a wider community. We also saw that we could do this without giving up family togetherness and cohesion. We still have mornings and afternoons and weekends to do stuff together, to enjoy each other’s presence, to love each other and grow closer together. And we are rejuvenated when we reunite. It’s a win/win solution that works well for our family. Does Sudbury schooling then differ in philosophy from unschooling? There’s no doubt about it. Are there commonalities? Yes, definitely. Are you as parents free to make choices in what to suggest for your kids? This article is an attempt to consciously and honestly influence you to answer “yes.” But that too is your choice. I’ve just always let my daughter decide if and when and where she wants to go to school. That is part of unschooling too, letting your child make his or her own decisions. She didn’t want to go to school for the most part, but she was alwys spending tons of time outside of my house and away from me. But we are lucky to have a huge support groups here with some parents taking other peoples kids. I guess when you have an only child and are a single parent, keeping her home all the time is never an option from the beginning. That’s wonderful you have the option of support groups and time for her to go out on her own. I agree that’s what unschooling is about too: letting them go to school if they want to. That can be a tough one. Thanks for contributing! Thank you for a refreshing take on the socialization question. This is in fact something that has been on my mind for a while. We are unschooling our daughter; but I don’t want her to become unable to seperate herself from me as she grows older, as I have seen homeschooled children suffer from. Sadly for us, there is no unschooling school solution, so I think we’ll just have to come up with that ourselves. Thanks for sharing. 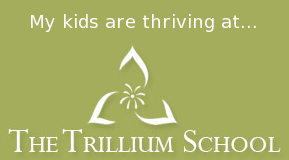 I’m not sure what we’d do without The Trillium School. But, yeah, we’d probably figure something out too. There’s always summer camp.